19.15 Brud will present their ongoing research on HERM, a space-time based on gravitational lensing, illustrated by an Umstuelpung, or a turning inside-out of the (white) cube. During the convention, Kasia Górna and Kasia Witt will lead workshops in the production of learning flags including Knowledge is Power, and Brud will animate Oloid. The current exhibitions Making Use: Life in Postartistic Times, Bread and Roses, and Why We Have Wars, will also be open for viewing. Brud is a Set Of Heuristics That Gained Sentience in the Twenty-Teens. Carl Martin Faurby is a freelance curator and writer, whose cultural investigations make use of contemporary artistic methods, while taking place outside of institutional contexts. European Institute for Progressive Cultural Policies is a progressive Vienna-based research institute, facilitating a wide range of publishing and research activities focused on contemporary social and cultural critique (www.eipcp.net). Free/Slow University of Warsaw is an independent self-educational and research platform, investigating the political economy of contemporary art (wuw-warsaw.pl). Isola Art Centre has gained international recognition for their decades-long experimentation, located at the intersection of contemporary art, organizational forms, theoretical poetry, and urban activism (www.isolartcenter.org). S.a.L.E. Docks is an independent space for visual art initiated in 2007 by a group of citizens who decided to occupy abandoned salt-storage docks in the heart of Venice (www.saledocks.org). The Walking Theory from Belgrade operates as an independent platform for reinforcing the critical and experimental practices / discourses in contemporary performing arts (www.tkh-generator.net). Joanna Warsza is an independent curator and educator, currently leading a curatorial course at Konstfack in Stockholm. 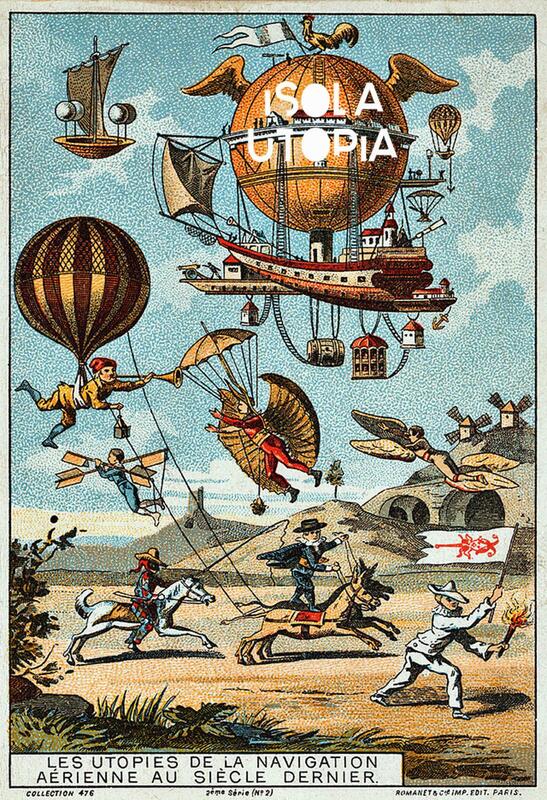 Isola Utopia, Fragments and Moments for New Utopias, collage, 2014, courtesy Bert Theis, Isola Art Center.